The Very High-Frequency (VHF) Omnidirectional Range (VOR) system is used for air navigation. Though older than GPS, VORs have been a reliable and common source of navigation information since the 1960s, and they still serve as a useful navigational aid for many pilots without GPS services. A VOR system is made up of a ground component and an aircraft receiver component. Ground stations are located both on and off airports to provide guidance information to pilots both en route and during arrival and departure. Aircraft equipment includes a VOR antenna, a VOR frequency selector, and a cockpit instrument. The instrument type varies but consists of one of the following: an Omni-Bearing Indicator (OBI), Horizontal Situation Indicator (HSI) or a Radio Magnetic Indicator (RMI), or a combination of two different kinds. Distance Measuring Equipment (DME) often is collocated with a VOR to give pilots a precise indication of the aircraft's distance from the VOR station. VORs have AM voice broadcast ability, and each VOR has its own Morse code identifier that it broadcasts to pilots. It ensures that pilots are navigating from the correct VOR station, as there often are many VOR facilities within range of a single aircraft. The ground station is aligned with magnetic north and emits two signals—a 360-degree sweeping variable signal and an Omni-directional reference signal. The signals are compared by the aircraft's receiver, and a phase difference between them is measured, giving a precise radial position of the aircraft and displaying it on the OBI, HSI, or RMI. VORs come with high, low, and terminal service volumes and dimensions. High-altitude VORs can be used up to 60,000 feet and 130 nautical miles wide. Low-altitude VORs service aircraft up to 18,000 feet and up to 40 nautical miles wide. Terminal VORs go up to 12,000 feet and 25 nautical miles. The network of VORs typically provides thorough coverage along published visual flight rules (VFR) and instrument flight rules (IFR) routes. As with any system, VORs come with some potential problems. While more accurate and usable than the old nondirectional beacon (NDB) system, VORs are still a line-of-sight instrument. Pilots flying in low or mountainous terrain may find it difficult to successfully identify a VOR facility. Also, there exists a "cone of confusion" when flying near a VOR. For a brief period when an aircraft flies near or over the top of a VOR station, the aircraft instrument will give erroneous readings. Finally, VOR ground systems require constant maintenance, and they commonly are out of order for short periods of time while maintenance is performed. After tuning to a VOR facility's frequency and identifying that the Morse code is correct, pilots can determine on which radial to or from the VOR station the aircraft is located. The OBI, HSI, or RMI indicator in the cockpit looks like a compass or a heading indicator, with a superimposed Course Deviation Indicator (CDI) needle on it. The CDI will align itself with the radial the aircraft is on. Paired with DME, a pilot can determine a precise location from the station. Also, the use of two VOR stations makes determining a precise location even more accurate by using cross-radials, even without DME. Pilots fly certain radials to or from VORs as a primary way of navigating. Airways often are designed to and from VOR facilities for ease of use. 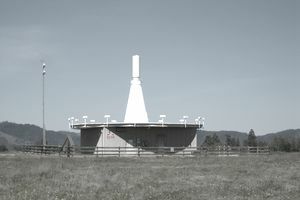 In its more basic form, a VOR facility can be used to go directly to an airport. A large number of VOR facilities are located on airport property, allowing even student pilots to fly directly to a VOR to find the airport easily. The VOR system is at risk of being decommissioned by the FAA due to the popularity of new technology such as GPS, wide-area augmentation systems (WAAS), and automatic dependent surveillance-broadcast systems (ADS-B). As of 2018, pilots still use VORs as a primary navigational aid, but as more and more aircraft are equipped with GPS receivers, VORs most likely will be retired from use.